Home » Posts » Attentionology for K-5 Teachers » Attention-Getting Teaching Tools are in the Bag! Use a small felt bag decorated with a funny creature to create a bag of writing prompts. Colorful, interesting, fun and funny bags of all kinds beg for attention. Bags, plain and fancy, can become focal points for learning activities. Bag of Alien Writing Prompts – Select a paper or fabric bag with an alien or other funny character on the front. 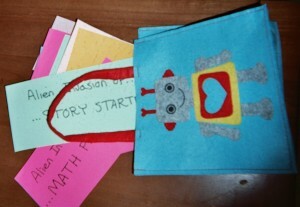 Use the bag to hold paper slips with story starters for students to choose at writing time. As a hook into the writing lesson, announce that you discovered an “alien (or other character) invasion” of story starters on your desk that morning. Students will enjoy the ruse. Tell them that a message arrived with the bag, begging for attention on building students’ core writing skills. Walk around the classroom and invite students to reach into the bag to catch a story starter. Place the bag in a prominent place during writing time. In grades K – 3, use decorative cellophane bags with attractive colors and designs, available in dollar stores and party supply stores. 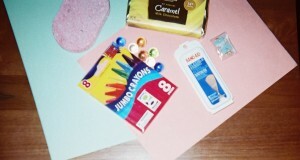 In grades 4 and 5, use clear inexpensive cellophane bags like small “baggies” or newspaper covers. Drop in small objects that connect to listening and learning skills, and plan time to discuss each object and its connection to paying attention with students. Beg for Attention with a Distraction Bag – A distraction bag is nothing more than a large clear and clearly identified – plastic bag that a teacher can easily open in front of students. 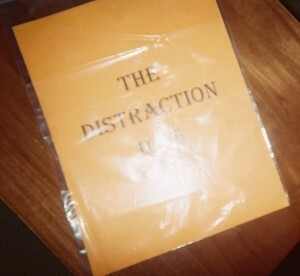 A Distraction Bag is a large clear, easy-to-open plastic bag with a title page that begs for attention and imparts a strong message. Kids immediately get the humor in it. Make the connection with your K – 5 kids, in age appropriate ways, that dropping distractions into a Distraction Bag is a great way to de-clutter our minds. Use them to create a new sense of focus on getting good work done in school. Distraction bags are especially timely because the word distracted keeps popping up, not just in safety and business news, but also in school. In years past, the term, distracted students, usually referred to children who were diagnosed with attention deficit disorders. Distracted students who struggle in school now come in all descriptions. 1 Pings/Trackbacks for "Attention-Getting Teaching Tools are in the Bag!"